as the waters cover the sea, Habakkuk 2:14. Politics. Americans are in that season, are we not? Some of us may be conceding involvement while others are excited at the prospect. One thing is for certain… the American battle for presidency has given much for entertainment. Soon the satire, comedy and bombast will give way to a new President of the United States of America. A sobering thought. Sailing southward to Colombia and the place we’ve chosen to call ‘home’ these last twenty years on account of God’s call upon our lives the scene has likewise been one of political battle, this time for a peaceful civility and the cessation of violence in what has been the longest civil war in human history from inception in 1948. Over this long history the principal actors have been the State, various mafias, rogue militias and a large number of well financed and organized rebel groups chief of whom are the presently better known FARC and ELN. The interplay between these actors have made for what is a very complicated political cesspool where all too few self-proclaimed experts have occasionally offered some measure of concession to the increasingly hopeless and victimized, yet I assure you a very opinionated public. As expats we are sometimes asked what we think about such-and-such, but have learned to prudently bite our tongue so as not to inflame deep emotions. We know of those who chose to mix politics with the Gospel only to find themselves targets, some losing their lives, others extorted or threatened. We have learned it is best to depend on God to lead even in those seemingly innocent day-to-day conversations. 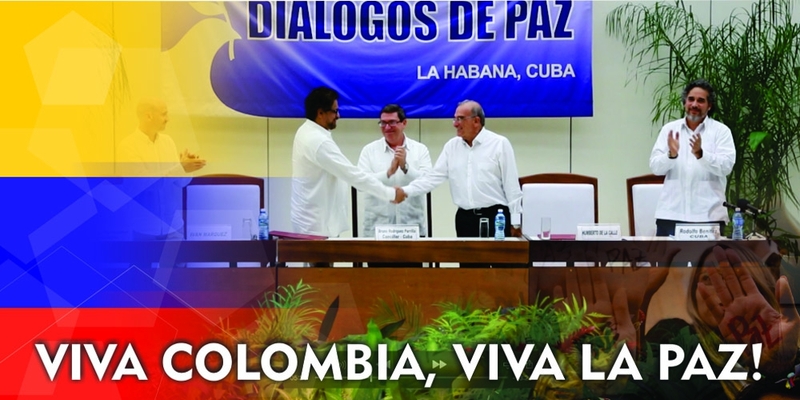 You may be aware of the four-year Colombian peace process hosted recently by Cuba, a process principally between the FARC and the State resulting not only in a ceasefire for the rest of 2016, but also a Peace Accord that was eventually voted down by the Colombian people with a “NO” referendum vote five weeks ago, Sunday, October 2 (clic here to read more). The referendum was defeated by a slim margin principally on account of impunity and justice-related issues, notwithstanding the adamant opposition by former President Alvaro Uribe and his Democratic Center Party for what they allege would be personal retribution and vendetta. Regarding the Catholic, Mainline Protestant and Evangelical churches there were varying perspectives and pro/contra voices that resulted in high emotions at the referendum defeat. I know of Christian leaders who cried away the entire night saddened by their conclusion the war would never end. I confess I too was saddened as one who has been directly affected by the hostilities in one way or another. I know of others who were jubilant at the defeat on account the Peace Accord held small-print concessions for LGBTQ ideologies. While most people of faith I know take serious issue with the LGBTQ ideologies that unquestionably encroach upon the social rights and freedoms of the general populace it was thought by some the cessation of violence, loss of life, unchecked crime and incontestable property damage might trump other agendas, convinced a “NO” vote would set the process back for years to come. So it was thought and publicized, but no one could have foreseen what would take place this last weekend. How surprised we believers in Christ and His ‘Kingdom peace agenda’ have been to learn of the results of an unexpected invitation given by the State to three prominent evangelical leaders to testify before the entire Assembly in Havana, Saturday October 29, as the principal actors again seek to craft a new Peace Accord now being publicized as possible before Christmas (clic here to read more). Among them was a good pastor friend of mine who was one of the primary voices against the referendum, believing by faith in a better way forward for peace… one that would promote dignity in gender differences in terms of victimization for the weak and innocent, family values with a recognition that it has really been the common Colombian family that has suffered innumberable injustices, the rights of the unborn as the silent victims of untold abuse and ultimately God’s Kingdom purpose in exalting Jesus His Son over all. All three gave testimony before the Assembly, but what followed was beyond anyone’s imagination… a three-hour, closed-door session between these three pastors and three top leaders of the FARC, a meeting brought about at the FARC’s request! "There was an openness to the Gospel that was divinely inspired by God that continues to leave all surprised," my pastor friend said. 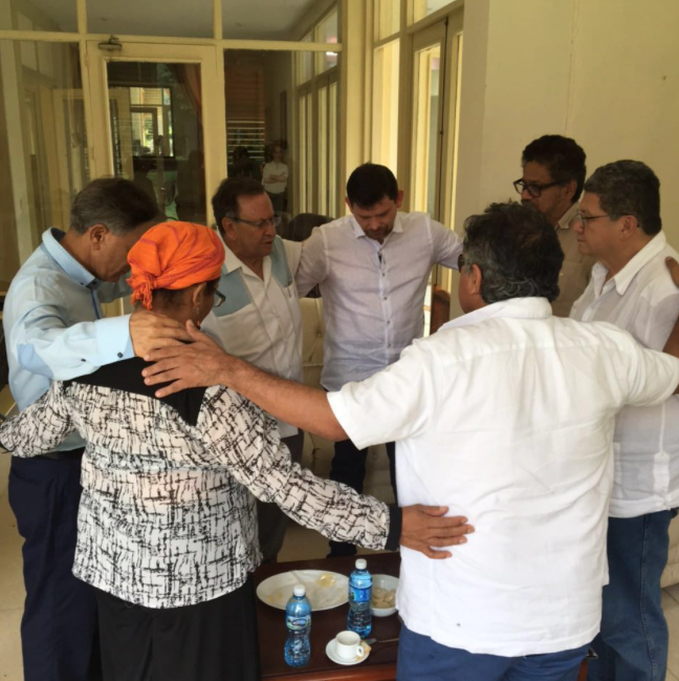 These pastors prayed for the FARC leaders, and then when asked if they would like to make Jesus their Lord and Savior all responded in the affirmative repeating salvation prayers as guided by another one of the pastors. Could this be the beginning of something beyond our coveted civil peace in Colombia… true peacemaking between sinner and God Almighty! What a glorious moment for Colombia! Yet more importantly, what a glorious moment for God to receive all glory! We are called to make His name famous and this is how it begins. In speaking with my friend again this morning Monday he is as conscious as I that this represents nothing more than a beginning, but what a beginning! What an incredible new chapter is being written! It seems there will now be a new Peace Accord and the FARC themselves is insisting there be more attention given to these concerns! One War Front of the FARC even gave the go-ahead over the weekend to an all-night prayer vigil to be led by evangelical believers, with the invitation for more evangelistic work to be done in their area. I am more encouraged than ever before at this news, as well as chastened in my own political thought. I thank God for my friendships here of such humble men and women of God who stand strong for our Lord. I am also thankful for their love for me in spite of me. Wait upon, and for God’s direction with patience and forbearing. Pray for your leaders in the spirit of Romans 13:1-5. Show no fear in asking God for opportunities to make His name famous among the nations. Adopt a willingness to admit mistaken political perspective. Commit yourself unswervingly and uncompromisingly to God’s Kingdom purposes. And above all, walk humbly with your God. Finally, and in somewhat similar light I share a blog link from a good friend living in Lebanon that can serve to challenge us all to keep the unreached Muslim world in view when we vote November 8 (clic here). You might also keep our Middle Eastern dear Lebanon in your prayers today as Gen. Michel Aoun assumes the presidency in a deal that will extend Saad Hariri, the leader of the Future Party as Lebanon’s prime minister. Aoun is the leader of the largest Christian bloc in the Lebanese parliament and an ally of Hezbollah. Lebanon has been without a president for over two years. If you would like to read more clic here.